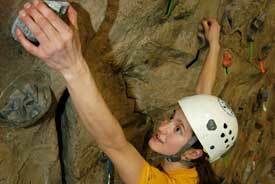 The rock climbing wall, located in the Gillett Wellness Center and towering over 30 feet with routes for any skill level, is one of the premier indoor rock climbing facilities north of the Twin Cities. Top rope or lead your way up the cracks, corners and crimpers. Instructional clinics, as well as open climbing time and group rentals, are all available at the climbing wall. During the academic school year, the wall is open five days a week. For more information contact the Wellness Center information desk at (218) 755-4135 or the OPC at (218) 755-2999.